Don’t get left out of the mobile revolution: Reading your webpage on a smartphone cuts comprehension by 48%, attention by 50% and reading speed by 20% to 30%. Now what? What’s irritating on a laptop can be overwhelming on a smartphone. It’s not easy to get the word out on a 3×6-inch screen. Mobile meltdown? It’s not easy to reach readers on their smartphones. In fact, the folks at the Nielsen Norman Group have identified 335 obstacles to getting the word out on mobile devices that don’t exist on laptops. “The phrase ‘mobile usability’ is pretty much an oxymoron,” says Jakob Nielsen, principal of NNG. In this environment, how do we reach readers online? The good news is, best practices for web and mobile copywriting can help. In fact, just three simple tweaks have been proven in the lab to boost usability more than 124%. Do your team members know those tweaks? People spend 96% of their time on websites looking, not reading, according to a Xerox PARC critical incident study. Because even highly educated web visitors read, on average, just 20% of words on the page. Indeed, web visitors read, on average, 20% of words on the page, according to an analysis of 50,000 page views of European computer scientists, psychologists, sociologists and engineers. Pass The Palm Test. Improve reading time, comprehension and satisfaction with one quick trick. Take five simple steps to write links that get scanned and clicked. Use a six-step process to transform your bulleted lists into freestanding information packages that lift key messages off the screen for nonreaders. Bust the myth of page view time: Measurably boost understanding, memory, satisfaction — while costing readers 50% less time. Pass The Skim Test: Make sure even flippers and skimmers can get the gist of your message — without reading the paragraphs. Web visitors spend 80% of the time above the fold, or on the first screen of a webpage, and just 20% below the fold. Material near the top of a webpage gets 17x the attention of that near the bottom. The average difference in how users treat information above vs. below the fold is 84%. Reach readers where their eyes are. Optimize webpages for Google and humans with our three-part test. Note: If you’re still using SEO tricks you learned in the ’oughts, Google may be penalizing your pages. Don’t drop the deck. Learn to make the most of the best-read element on your webpage. Steal headline-writing tips from the BBC — the source of the best news heads on the web, according to Nielsen. Attract 300% more readers and 520% more reading? Get more social media shares? Boost readership, understanding, engagement, interest, satisfaction and more? Learn a structure that’s been proven in the lab to increase readers by 300% and reading by 520%. Start your webpage with a bang with four types of web leads to try. Tap three secrets of successful subheads. This “may be the most important thing you do” to improve usability of your webpage, according to the authors of How People Read on the Web: The Eyetracking Evidence. Get mobile visitors past the first screen of their smartphones with best practices for mobile menus. Get out of your own way by removing four items from the top screen that may be getting between your mobile visitors and your message. “What’s slightly annoying” on a desktop can be “overwhelming” on a smartphone, according to the authors of User Experience for Mobile Applications and Websites. It’s 48% harder to understand messages on a smartphone than on a laptop. People read 20% to 30% slower online. But they read about 30-milliseconds-a-word slower on mobile devices than they do on desktops. Attention spans on mobile devices are 50% shorter than on laptops. So while mobile reading takes longer, people spend less time on a page when reading on their phones. How do you avoid overwhelming mobile visitors? Learn three tweaks that will increase webpage usability by up to 124%. Pass The 1-2-3-4-5 Rule for online paragraphs. Tip: Test it on your smartphone for best results. Use a cool — free! — tool for testing your webpage’s clarity. 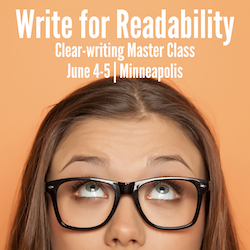 Get a paragraph-by-paragraph analysis of ways you can measurably increase readability. Avoid The Mobile Paradox: The No. 1 activity for mobile users is wasting time. But mobile users get “visibly angry” at verbose sites that waste their time. How do you avoid enraging readers? It never fails: After attending our one-day writing workshop, the No. 1 thing participants wish we’d had more time for is extra time for practice and feedback. But when you make your workshop a two-day Master Class, your team members will have time to practice the skills we learn in class, get feedback from me and the group, and leave with a totally rewritten piece. Make Ann your team’s personal writing coach. 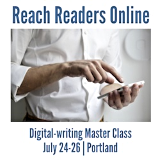 Lift Ideas Off the Screen: Reach nonreaders with display copy. Get to the point faster: Because web visitors spend 80% of their time above the fold. Master the Temple Structure: It’s been proven in the lab to be more effective than the form you’re using now. Practice sessions: Master the techniques we learn in class.